There's a lot of Christmas gift guides out at the moment and although this post is Christmas themed and it is essentially a guide, I thought I'd do one that's a bit different. When I've been browsing all the Christmas beauty sets online this year, the one thing that keeps catching my eye is beauty baubles. Why get a normal bauble for the tree when you get one filled with a beauty treat?! They make great stocking fillers or a little festive treat for your bad self. 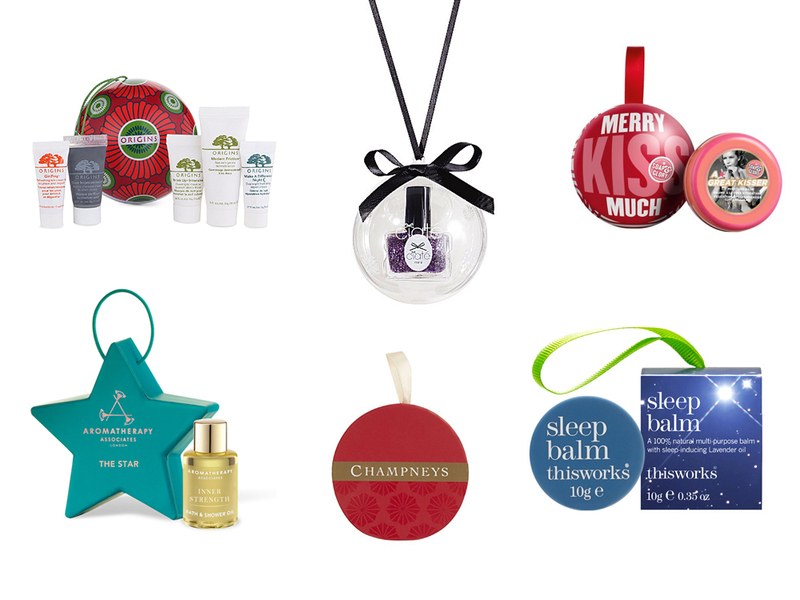 Here's my favourite Christmas beauty baubles of 2014; there's something for everyone! Exclusive to Selfridges is the Origins bauble, offering 5 of their best selling skincare minis. This year it's the GinZing Refreshing Eye Cream, Make a Difference Overnight Hydrating Repair Cream, Clear Improvement Charcoal Mask, Drink Up Intensive Overnight Mask and Modern Friction Exfoliator. If it wasn't for the expensive Selfridges delivery charge I'd have already bought one for myself! The most affordable bauble of the bunch, this one stands out to me as being perfect to give to someone like your Mum or Gran as it's one of those classic spa brands. The bauble contains a 50ml Oriental Opulence Body Cream. Kisses under the mistletoe calls for a hydrating lip balm and this bauble contains the aptly named A Great Kisser Lip Balm in Juicy Peach. Containing Mango Butter, Apricot Butter and Pomegranate, this sounds just the ticket. Festive nails will be yours (or mine) with this cute bauble containing a miniature, sparkly nail varnish, which is available in 5 different shades. I love how Ciaté have added their signature black bow to the bauble too. This star shaped bauble contains a 7.5ml Inner Strength Bath and Shower Oil, which contains Clary Sage, Frankincense and Cardamom Essential Oils to bring calm and peace. It sounds divine! Plus 10% of the proceeds will be donated to the charity Defence Against Cancer. As someone who has ongoing struggles with sleep, I'd love to have this Lavender, Vetiver and Camomile infused balm hanging on my tree! I've great things about This Works products and this would be brilliant to use at the end of a relaxing pamper evening. Which Christmas beauty baubles have you got your eye on this year? All are gorgeous, love the look of the S&G one! These are so cute, I definitely want to get myself one of the Soap and Glory ones!